Now that site speed is officially a Google ranking factor site performance and page load time are important for SEO as well as usability. So how well do major news sites perform in these areas? 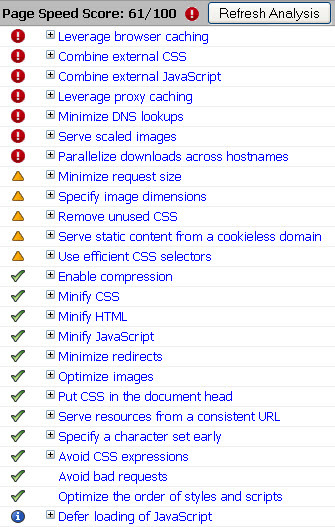 To get a basic idea I ran Page Speed, the open source Firefox/Firebug add-on that Google recommends, on the home page of 25 news sites. The sites include a mix of major newspapers, news magazines and TV news sites. I started with the group I used in my news sites domain authority post and added a few more. It is mostly US-focused but five UK sites have also been included. Keep in mind that Page Speed analyzes page performance against a series of “rules” that are known to speed up load time. Scores are on a scale of 100 with a high score being good. (This can cause confusion as some users equate a high number with longer load time, but in fact the opposite is true). So which news sites fared best? The Wall Street Journal leads the group by a considerable margin and The Los Angeles Times has the unfortunate honor of coming in last (though not by much). UPDATE: After Mike’s comment below I added Yahoo! News which scored well and took second place. One thing to note is that Page Speed scores fluctuate a little each time you run it. I double-checked several pages; some scores remained the same but others changed by 1 or 2 points. To take the comparison a step further I also ran Page Speed on the top 10 sites’ lead article. Home pages will rank well for branded searches regardless of site speed so it is at the content level that the scores matter more. The Wall Street Journal still had the best score but the UK’s Mail Online jumped up to tie it. Interestingly three of the five UK sites made the top 10. UPDATE: Adding Yahoo! News moved it to the top of the group for articles and knocked Guardian.co.uk out of the top 10. So how important is site speed? Both the official announcement and Matt Cutts’ follow-up post emphasize the fact that site speed is just one of 200+ ranking factors and signals like relevance and reputation continue to carry much more weight. In addition site speed is impacting only a small number of queries at this time. 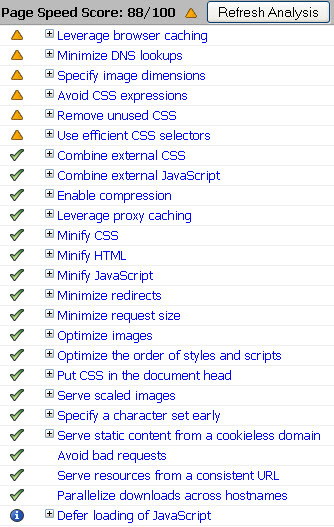 So you don’t need to drop everything and make site performance your #1 priority but it is something to be mindful of. And since it is good for both SEO and usability why wouldn’t you want to get it dialed in? At a minimum you should monitor the Site Performance data in your Webmaster Tools account and make an effort to minimize your average load times. As you can see there are plenty of ways to make improvements. Any reason you’re ignoring the leader of the pack? Yahoo! News is still #1 (or #2 depending on whose numbers you use). Agreed, no need to drop all your other SEM efforts to focus on site speed, but it should be on the list of things to monitor. Every little bit counts, layer upon layer to get your site where it should be, achieving your end goal in your marketing efforts. Mike, you’re right that Yahoo News is more of a content site than a news search engine, and since I’d included Aol News that was an omission. I just ran its numbers. Both news.yahoo.com and its lead article at the moment got scores of 83. I’ve added them to the tables above and made updates to the post. Thanks. Nick, I agree, ‘every little bit counts’ is a good way to put it. improving page speed has always been a to-do thing for your page viewers no one wants to wait around to the page to load because they can always just go view another site and leave yours. Its interesting which news sites rank though I tend to use dailymail and it can be a bit slow sometimes.